The author once initiated a group of 5-6 year-old pre-school children into these basic facts of solar-planetary life. On the lawn outside the school, he set up a broomstick as CM, with a (rather large) teacher representing the Sun. Threads of wool linked each planet (represented by a child) to CM. Then the system was set in motion, the author, acting as director, speeding up and slowing down each planet (child) in order to show the effect of Jupiter-Saturn oppositions and conjunctions on the Sun at the centre (to her surprise she was almost pulled over by the conjunctions!). These small children understood immediately – in their bodies – the forces involved. With a hands-on approach, science can be taught to anyone! Above is a a light-hearted expression of the basic principles involved. The Earth and her Moon spin around their own centre of mass, while at the same time spinning around the centre of mass of the solar system as a whole. The Sun leans out on the other side of CM to balance the momentum of the Earth-Moon system. But it's more complicated than that. The CM of the Earth-Moon system actually lies within the body of the Earth, and both Earth and Sun also rotate around their own axes. And then there are all the other planets and their moons. Only advanced computer graphics could catch all the movements involved in the daily life of Solaris. in particular a system of several rotating bodies. This is much more complicated. 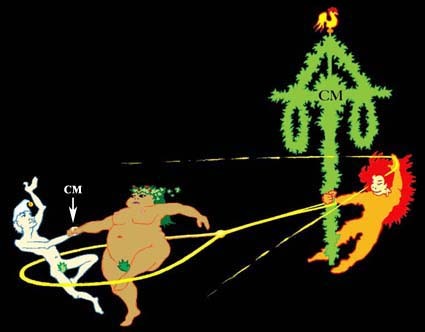 We are not only dealing with mass and distance from the centre; we also have to reckon with velocity (speed). It is Angular Momentum that explains why the planets can force the Sun to move as it does. 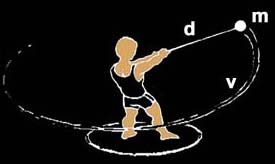 The picture of the hammer thrower gives a feeling for the enormous power exerted by even a small ball, if it rotates far enough from the centre. A shot thrower cannot cast nearly as far, even with a lighter ball. It is this, the velocity and, above all, the distance of the planets from the centre of the system, which explains why, despite their relatively small masses, the planets together command over 95% of the total amount of momentum in the system. 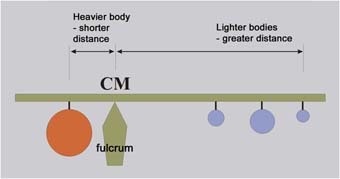 Another important point to remember is that the total amount of momentum in a system of rotating bodies is always constant. 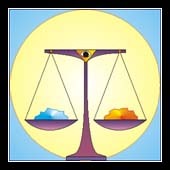 If momentum changes in one part of the system, another part has to make complementary and opposite changes in momentum for the system to remain in balance. As the planets follow their orbits, sometimes spread out, sometimes gathered in one or other sector of the system, the direction and strength of their combined angular momentum (known as "the planetary vector") is continually changing. It is this shift in strength of the vector that explains why the Sun moves as it does. In order to retain constancy of momentum in the system the Sun is forced either to increase or decrease its own momentum. Since it cannot change its mass, and only slightly its velocity, it is only by constantly changing its distance from the centre that the Sun can retain stability in the system as a whole. 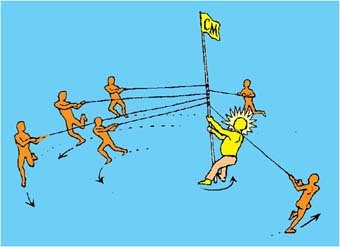 This explains the irregular pattern of solar motion around CM, described in the computer printout shown on an earlier page.